There is a strong presence of aerospace, defense and automotive companies in Alabama, all of which rely on harsh environment flexible electronics. With this addition, we are poised to increase the workforce needed throughout the state because of the new technologies created. In addition, manufacturing will be expanded with a base for higher-paying job opportunities. In addition, the state’s economic development plan “Accelerate Alabama” focuses specifically on these product categories. Auburn has formed relationships with several companies in these industries through past work in the area of harsh environment electronics and looks to continue and strengthen these relations. The institute's activities will benefit a wide range of markets including defense, automotive, communications, consumer electronics, medical devices, health care, transportation and logistics and agriculture. Also, The impact on the trade deficit will also be positively felt. Currently, the largest portion of the trade deficit is driven by elevated imports of manufactured electronic goods. We can assist in driving that deficit down through the creation of electronic manufacturing within the state and country. Eleven targeted business sectors, along with areas of focus for each, have been identified for the sate of Alabama to focus its recruitment, retention and renewal efforts over the next three years. The determination of these targets involved the review of the current business/industry base in Alabama, current targeted sectors of state, regional and local economic development organizations in Alabama, as well as the various power provider, recent project activity, and other emerging sectors that have shown growth at the national, state, and possibly local level. The strengths of Alabama related to each sector were also considered. 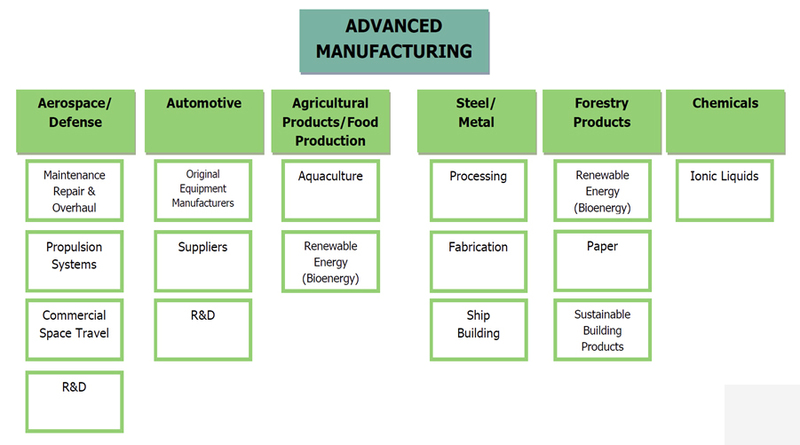 The targeted sectors and areas of focus are outlined below and further defined in this section.